Have read your e-book ...extremely interesting. I certainly hadn't viewed Revelation as being literally interpreted..you have encouraged me to search the Word more frequently and considering some of those more difficult scripture in that light. My question is in regard to Matthew 24:36-44. Could you please tell me where you would place this event in the time-line of things, and how does it relate to the place of safety, and the 144,000 . I have also heard it explained that the wicked would be taken, and the righteous "kept" or left behind as in the Days of Noah. How do you view this? So this is the rapture right after Satan's 3½ year/42 month/1260 day Great Tribulation  of wrath is completed. Jesus comes to gather his elect with the help of his angels into the sky on the last trumpet, the very Day of Trumpets or the "last trump"  that Paul spoke of (1Cor 15:52). This correlates to the seventh trumpet of Revelation which of course precedes the seven bowls of God's actual wrath, now that Satan's short time is done (Rev 12:12). 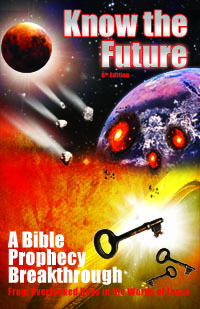 That ten-day wrath of God ends with the Second Coming of Jesus for the Battle of Armageddon  as Rev 19 depicts. Please note that the "wrath of God and the Lamb" pronounced at the 6th seal is a red herring or misleading statement. It is important to notice who is making the statement: the masses of the world, not God, Jesus, John or even an angel. The panicked masses assume, "It's Judgment Day!!" because of how terrible the global Wormwood cataclysm that start at the 6th seal is . Which judgement is that? The seven bowls are identified in Revelation as the wrath of God following the 7th trumpet  (whereas in contrast, the seals and trumpets are not God's judgments, although the group of all 21 events are often incorrectly collectively labeled as such). This passage and others seem to contradict the single "place of safety" view that Revelation 12 teaches , or that God's servants will be gathered in one place. Why? The problem is in how Jesus mentions that some will be working in the fields and at baking and some will be sleeping. This makes no sense unless those taken are scattered on different sides of the globe in different time zones (sorry, flat earthers ). Another problematic passage is Mark 13:27 which says, "He will send out the angels and gather His elect from the four winds, from the end of the earth to the end of the sky." Again, why would there be such language unless those raptured were not scattered everywhere? This is where understanding the 144,000 and their mission comes to the rescue. My book  demonstrates that Elijah  and the 144,000 are the ones who receive and broadcast the three angel messages (Rev 14:6-13) which partly fulfills the end time return of the preaching of Jesus' Gospel of the Kingdom  message that Jesus predicted (Mt 24:14). (Elijah must start preaching the Gospel sooner for repentance before the end . When civilization goes down, he'll pass the baton to the 144,000.) If you ever wondered why the 144,000 alone have the mobile protection from Satan's attacks (Rev 7;9:4), that is why. They alone will need it because they will be out delivering the witness to the world before the end comes. The rest of God's servants will be in a single safe place for the duration of the Great Tribulation as Revelation 12 describes . That all ends right after angels are seen taking God's people to safety (and it will culminate nine days later with the 7th bowl on Tishrei 10, Yom Kippur, the Day of the Lord when Jesus returns as Rev 19=Lev 16 describes ). If you're not sure you're ready for the rapture, read my article on the rapture requirements  next.